We are Now Booking for the most exciting fall wine festival in Europe! 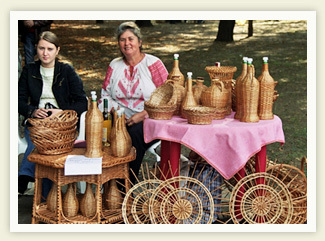 Every second week in October Moldova holds one of the largest wine festivals in Europe. This is the tour that will bring joy into your heart and long lasting memories of the humble people of Moldova. You have a chance to taste collection wines and rare delightful high quality wines not seen any place but in Europe. There are Barbeques and many different Moldovan foods to sample. 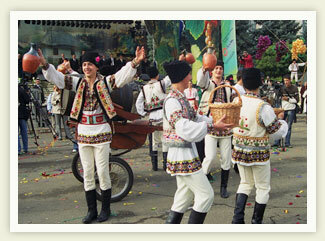 All day and through the night for two days, there will be folk dancing with music and parties to see and participate in. This tour is included in our packages with 7 day and 12 day tours in October each year. Contact us for all details of this tour. Please look over our photo gallery for past wine festival photos. In Moldova you are safe and free to visit cities and villages without problems from police and criminals lurking about waiting to bother or rob tourists. You can have a relaxing safe vacation with your guide, Dale Benson. Dale can show you the best of the world of Eastern Europe in transition from old world to the modern world. Also on the tour is a visit to the National History Museum in Chisinau, there is a replica of the Roman wolf and two abandoned children Romulus and Remus standing in front of the museum. It is a souvenir of Moldova’s past Dacian heritage. Dacians were the first to settle the territory of Moldova and Romania in 2,000 B.C. If you are a souvenir collector you can not pass up a chance to shop the open air markets where the exhibition of the Orient is located. Here merchants noisily bargain with customers for Moldovan carpets, lamps, vases and clothing. The paintings and ceramics sold here are done by highly skilled craftsmen. Often paintings that are worth hundreds of dollars in the United States can be a real bargain at the current U.S. to Moldovan currency exchange rate. The tour includes a stop at the humble cottage of Alexander Pushkin, the Russian poet who lived in exile during the 1820’s. The house remains virtually untouched to this day. 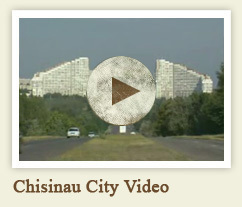 In Chisinau guests will visit Cricova wine cellars, the largest underground wine cellars in the world. They stretch over 100 kilometers under the city and roads. 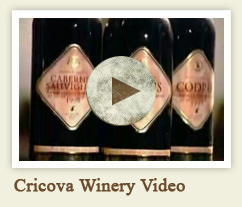 Cricova carries 648 varieties of wine in their cellars. Another wine cellar on the tour will be Milestii Mici, also an underground cellar. 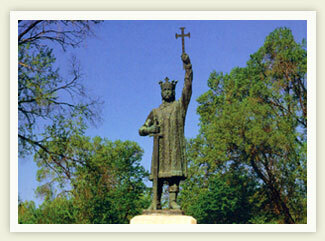 You will tour the amazing Fortress of King Stephen Cel Mare, who ruled Moldova from 1475 to 1504, in Soroca. The Fortress of Soroca was built on the location of an old fortress built by Moldovan Prince Petru Rares in 1527. The Fortress has four 60 foot high towers and a 100 foot long perimeter wall that is 9 feet thick. The battle worn structure stands as a historical testimony of the fortress encounters with Bellicose Tarter, Ottoman, Turk and Russian Troops. Another tour that can be part of the program is a tour through the old cave monastery in Orhei Vechi, where you may investigate the remains of Moldova’s Monastic Cave men. Some of the greatest wonders of the country are its monasteries. Most famous and extraordinary among them is the cave monastery Orhei Vechi with a view of the Raut River. This 13th century church was excavated from limestone cliffs by Orthodox Christian Monks who believed the cave would be resilient against invaders. Archaeologists have recently discovered ruins of Turkish baths and a protective wall built in the 15th century which sounds like a religious complex. The cave Monastery was closed during Soviet times and re-opened in 1996. 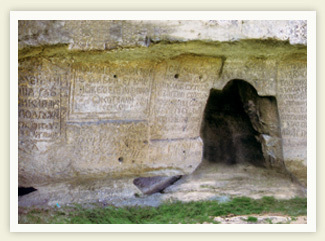 Services are now held at the cave monastery. Contact us to learn more about some of the best wines in the world. Copyright 2009 Moldova Traders. Maintained by GPI Holding.